A trip to the Big Island would not be complete without a visit to the Volcanoes National Park to see its two active volcanoes. 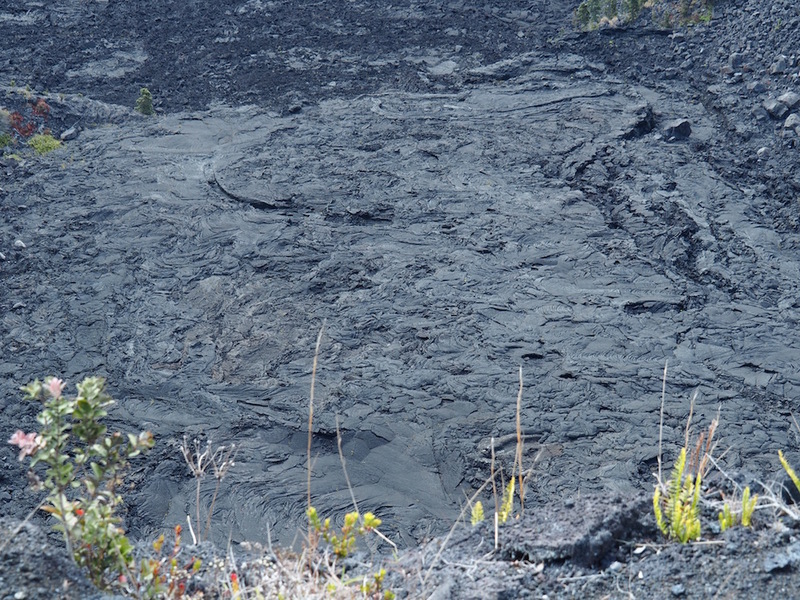 The Mauna Loa volcano last erupted in 1984 but the Kīlauea volcano has been erupting since 1983. It is the most active volcano in the world and over a million people a year visit the park to see it in action. 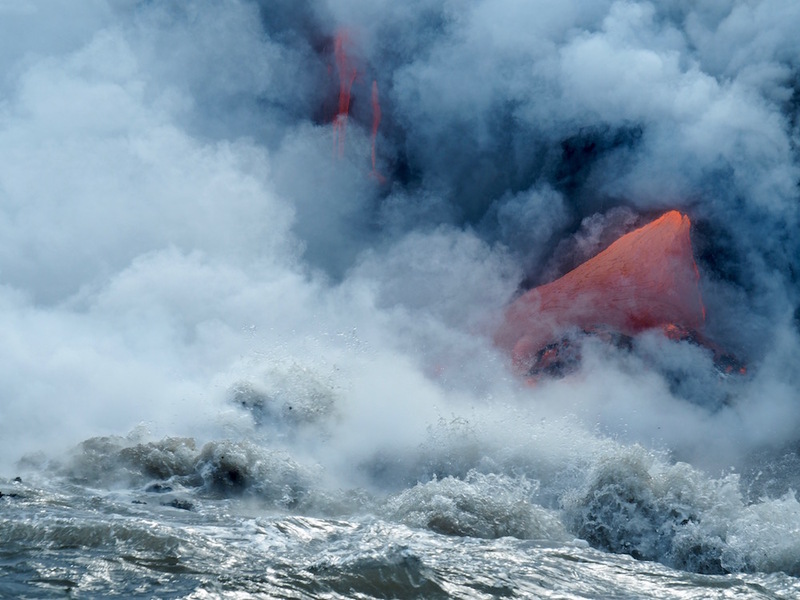 This makes it Hawaii’s most popular tourist attraction and it’s not surprising why. With 330,000 acres of lava fields this land is like nowhere else on the planet. It’s a place that should be on everyone’s bucket list. Stunning scenery on the Chain of Craters Road. It can be a bit challenging to witness the actual lava flow itself if you don’t have a lot of money to spend or a great level of fitness. But with an ample amount of hiking trails (both easy and hard), scenic drives and lookout points, chances are you will still find something to amaze you in the park. 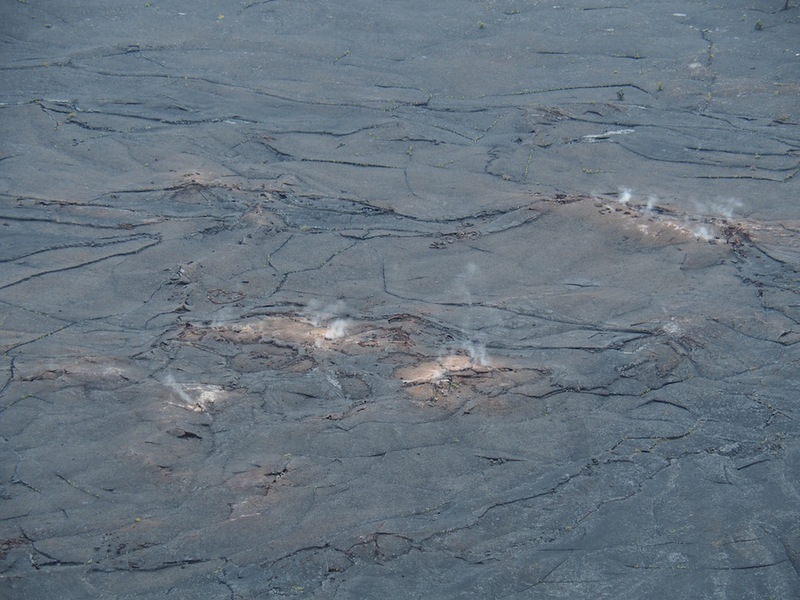 A solidified lava lake inside the Volcanoes National Park. You can see most of the park’s highlights in a single (very packed) day but we highly recommend taking a few extra days to enjoy more of what the park has to offer. The park entrance fee is $10 per person or $20 per car and is valid for seven days, so you might as well make the most of it. 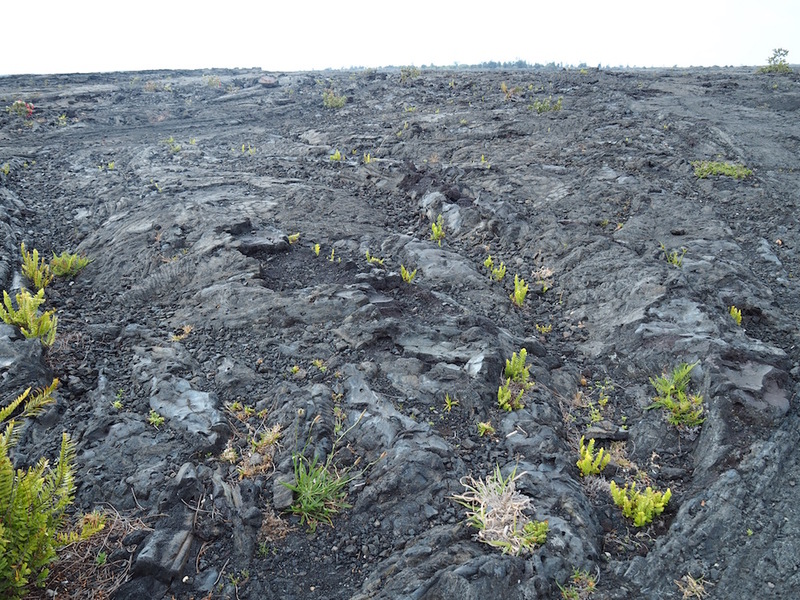 Even amongst the lava rocks, some plants can still grow. Every visit should start at the Kilauea Visitor Centre to get a map, to talk to the friendly rangers about the current lava flow situation, and to plan out your time in the park. For the best views over the steaming Halema’uma’u crater, drive west on Crater Rim Drive all the way to the Jaggar Museum overlook. This overlook gets very busy but you won’t get a better view of the smoking crater from anywhere else. 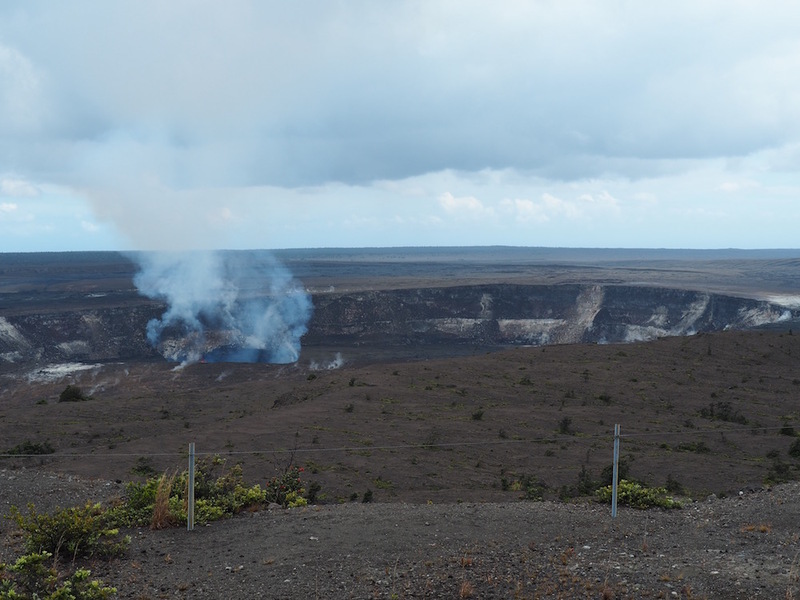 The view of the steaming Halema’uma’u crater from the Jaggar Museum overlook. While there stop at the Jagger Museum (named after Dr Thomas Jagger, a famous volcanist). There you can learn all about volcanoes, their history, the ongoing research into them; and to check out the exhibits they have on display. Note: The Crater Rim Drive is closed past the Jagger Museum due to a high level of sulphur dioxide gas. 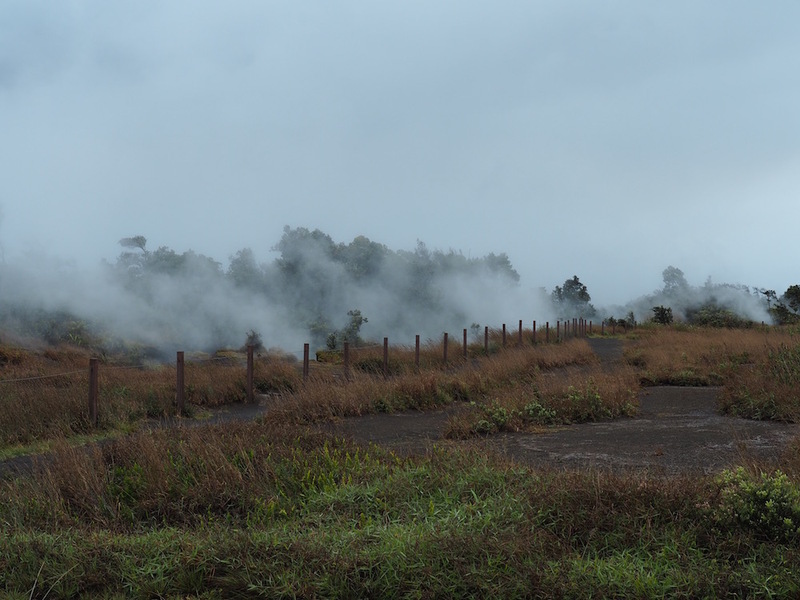 As you drive back from the Jaggar Museum, stop off at the Steam Vent car park just off Crater Rim Drive and walk a short distance to view the many steam vents that lead up to the rim of the crater. Lots of steam on a rainy day! If you go there on a rainy day like we did you will be amazed by the amount of steam being generated! 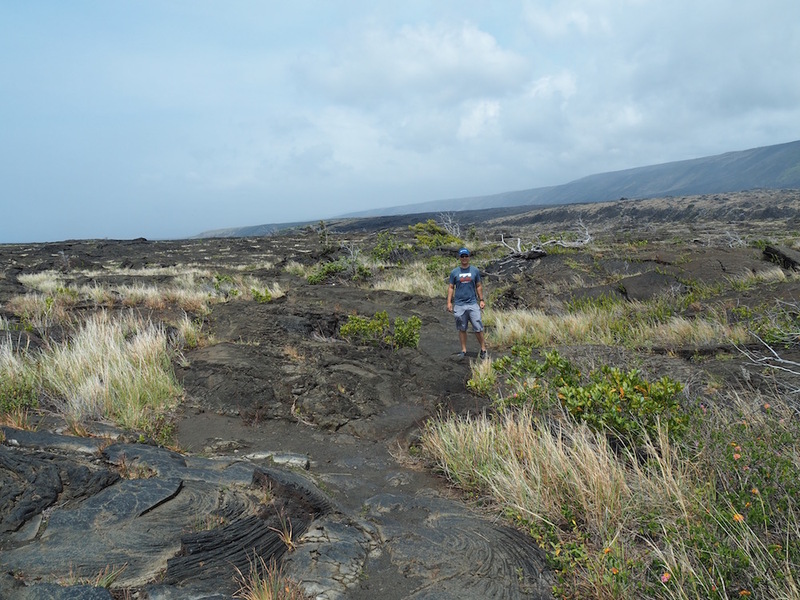 If you enjoy hiking and have the time it’s worth doing the short one-mile return hike from the Kīlauea Visitor Center parking lot. 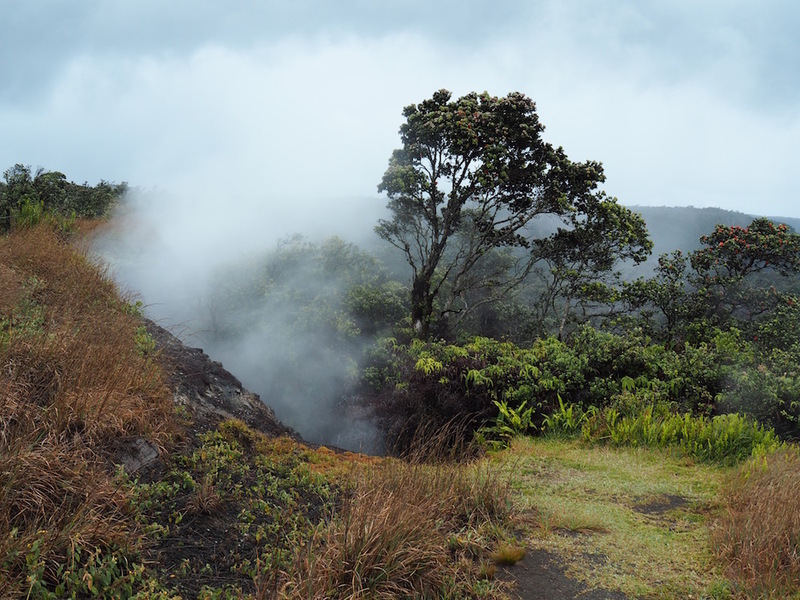 The Sulphur Banks trail is an easy hike and will take you past many more steam vents. A steam vent on the Sulphur Banks trail. If you only do one hike inside the park, make it this one! It’s a fairly easy four mile hike and can take from two to four hours depending on your level of fitness and how long you stay on the crater floor for pictures and lunch. 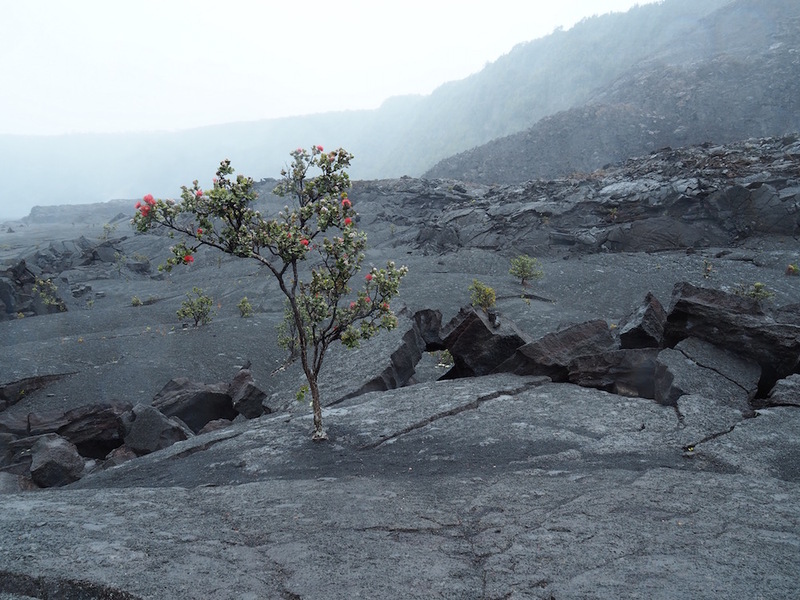 A tree growing through the old lava on the Kīlauea Iki Trail. 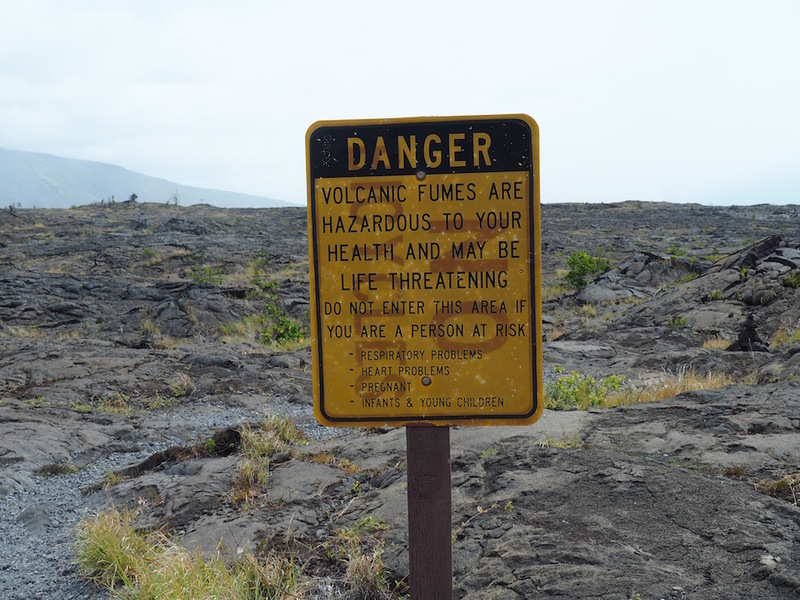 The hike starts at the Kīlauea Iki Overlook which is a five minute drive from the entrance of the park on Crater Rim Drive. People recommend doing the hike counterclockwise. It descends four hundred feet down through a native rainforest to the crater floor, across a solidified lava lake, and heads back up again through the rainforest. The walk across the crater is simply fascinating. Just imagine that it used to be a lake of red hot bubbling lava; incredible! Along the way, you’ll come across plenty of birds, beautiful wildflowers and some small steam vents. The trail is clearly marked with stone cairns and is very easy to follow. 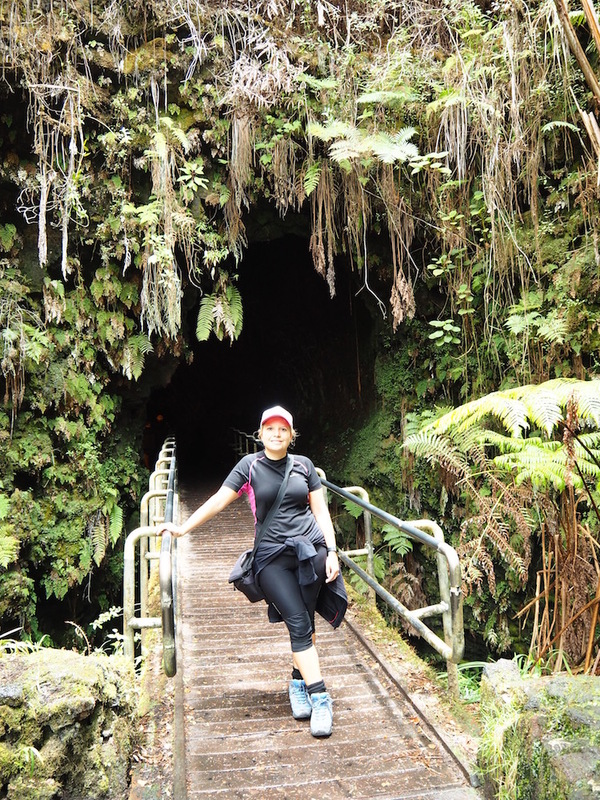 The Kīlauea Iki trail finishes at the Thurston Lava Tube so you can visit the tube after completing the hike. A very wet hike across a lava lake! 1- Leave your flip-flops in your suitcase for this hike as you’ll need good walking shoes. 2- Pack your rain jacket; you will most likely need it. It might be sunny when you start but will it be ten minutes later? 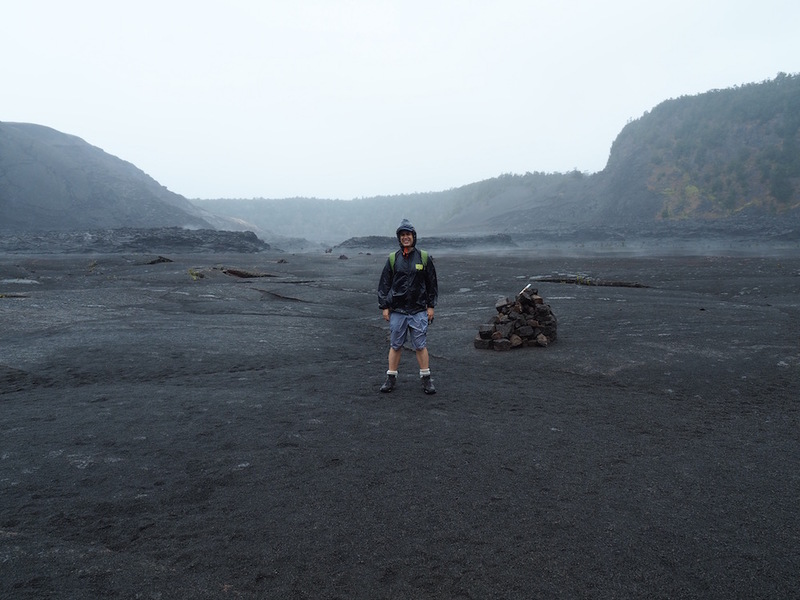 It was lightly raining when we started the hike but the more we descended the worse it got and it was pouring when we reached the crater floor. Needless to say, we were soaked! Still this hike was incredible and we enjoyed it a lot. It was like walking on a different planet! Simon soaked on the crater floor! 3. If you have young children with you, an easier way to tackle the hike is to walk it clockwise and then double back on your tracks once you’ve spent time on the crater floor. The path on that side of the crater is less steep and rocky. The steam vents on the crater floor. 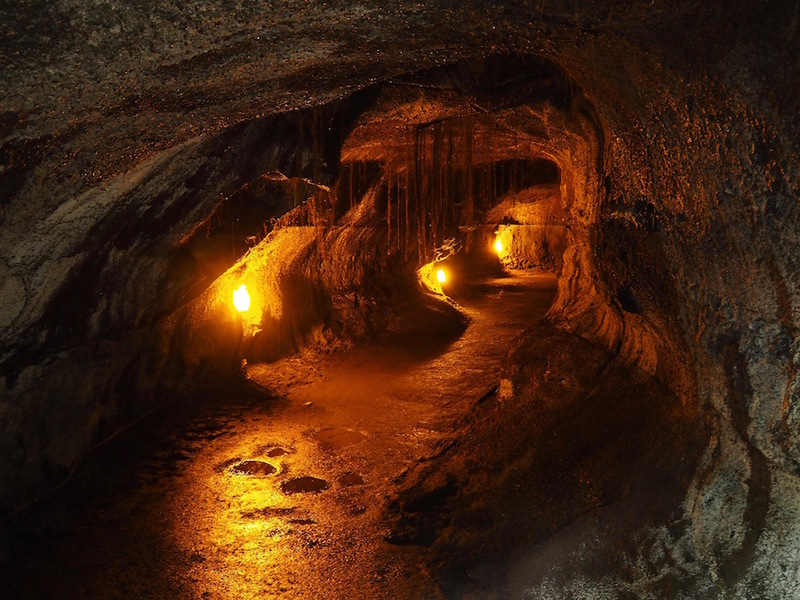 This tube was created five hundred years ago by the flow of lava and is hidden within a lush rainforest. The hike is less than half a mile long and is really easy to do. The entrance to the tube looks like a cavern and as you walk through the well-lit tube you feel the air getting cooler. 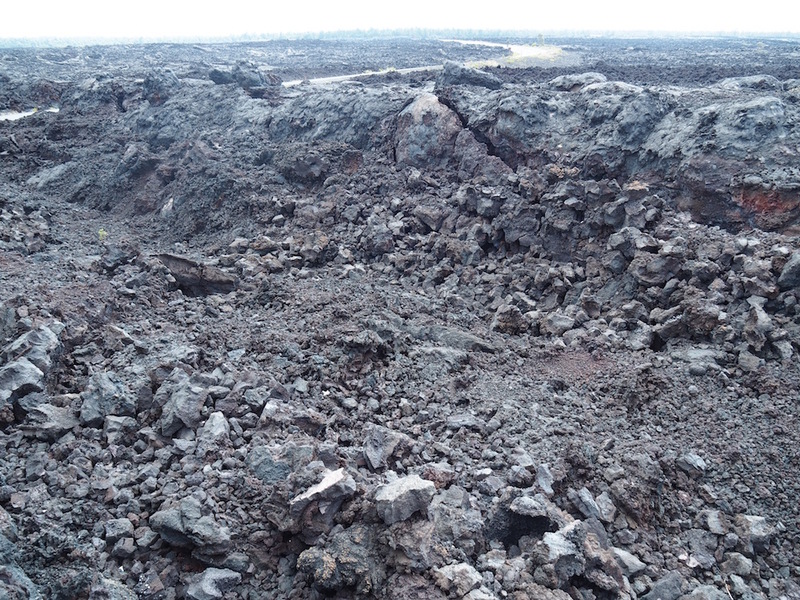 It’s a pretty awesome experience knowing that molten lava once rushed through it. The entrance to the lava tube. Tip: Try to visit early as parking is scarce and tourist buses make this one of their stops; it can get extremely crowded. Seeing the volcano in action at night is even better than during the day. If you are staying in the Volcano area for more than a day, or if you’re not in a rush to get anywhere, stay for sunset or visit after dark. 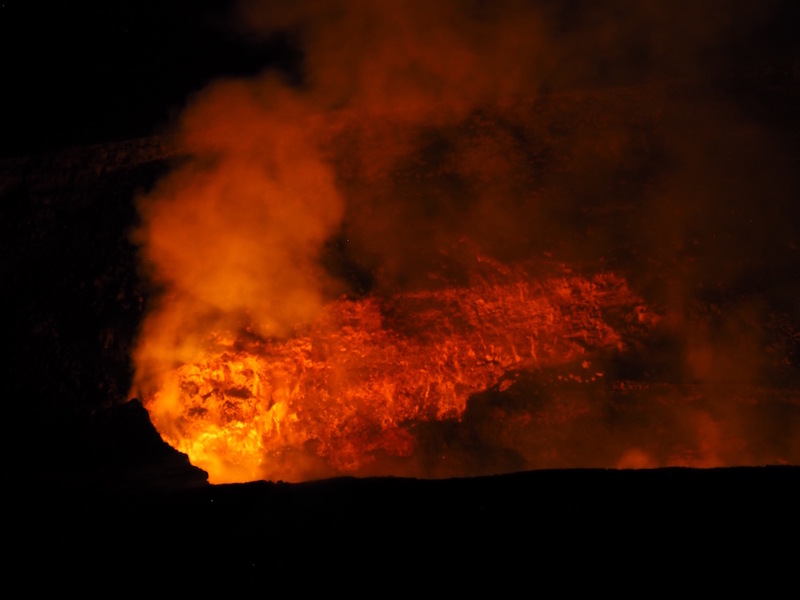 It’s pretty impressive seeing the orange glow of molten lava from within the volcano! The Jagger Museum again has the best view but even at night it still gets pretty crowded. A night shot from the Jaggar Museum overlook. The Chain of Craters road winds nineteen miles from Crater Rim Drive down to the ocean. 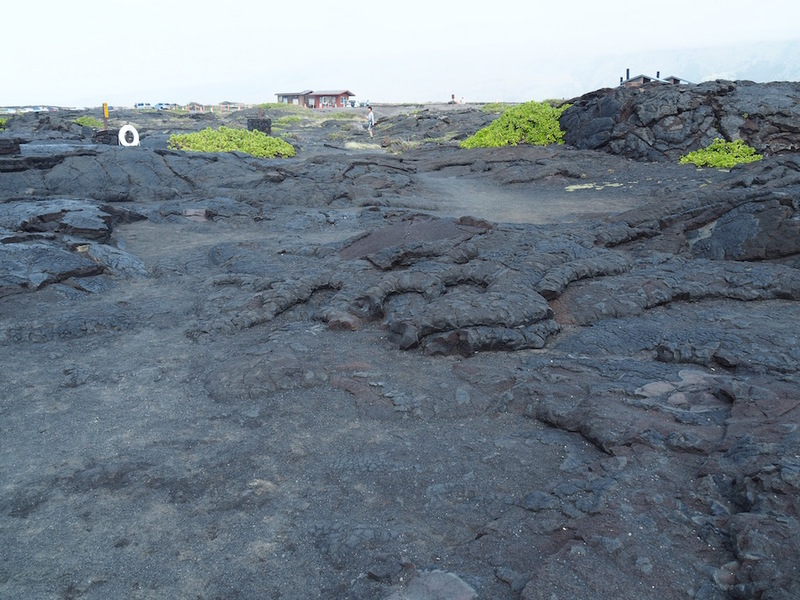 On the way down to the ocean you’ll be able to stop and admire several old volcanic craters and solidified lava fields. 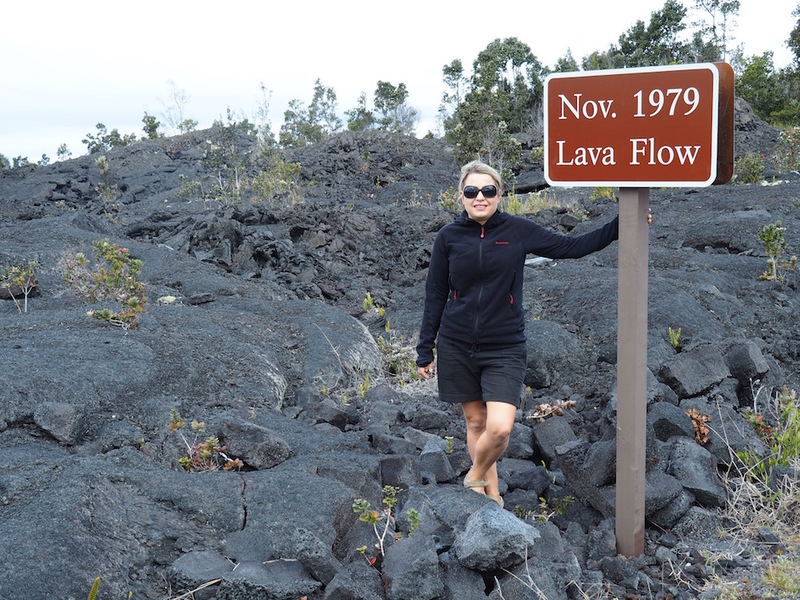 You may even find a lava field from the year you were born! This well paved road also offers breathtaking views with several scenic lookouts. Old lava from the month I was born! 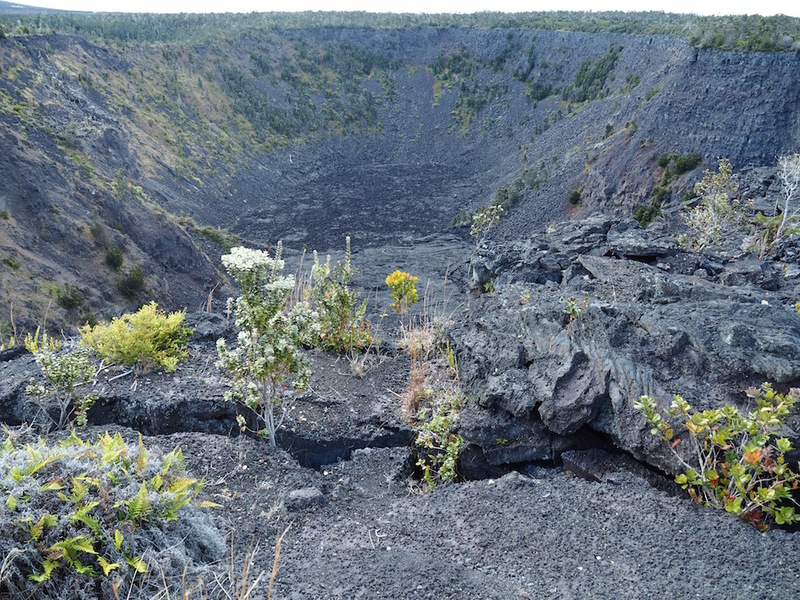 The Pauahi Crater on Chain of Craters Road. 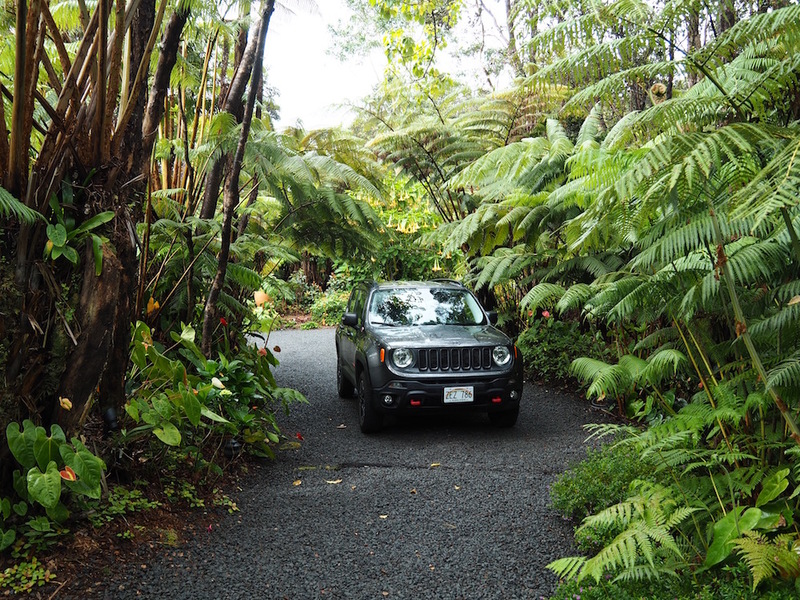 The road begins within the lush rainforest and as it descends the landscape becomes increasingly barren with the deep blue ocean on one side and the black lava fields on the other. The changing landscape is amazing! 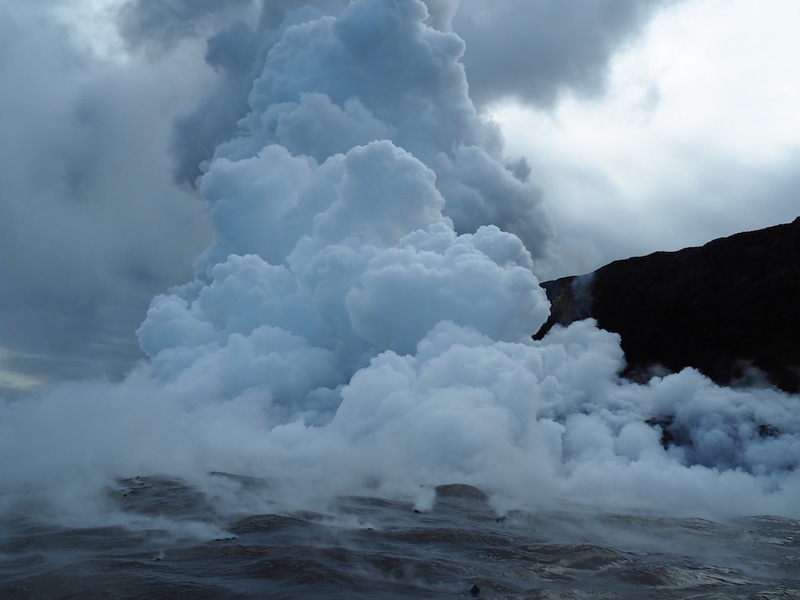 As it descends towards the ocean you’ll have some stunning views and you may even spot the clouds of steam coming off the lava as it pours into the ocean a few miles east. The road now terminates at Holei Sea Arch after a Kīlauea eruption damaged the road half a mile past the arch. 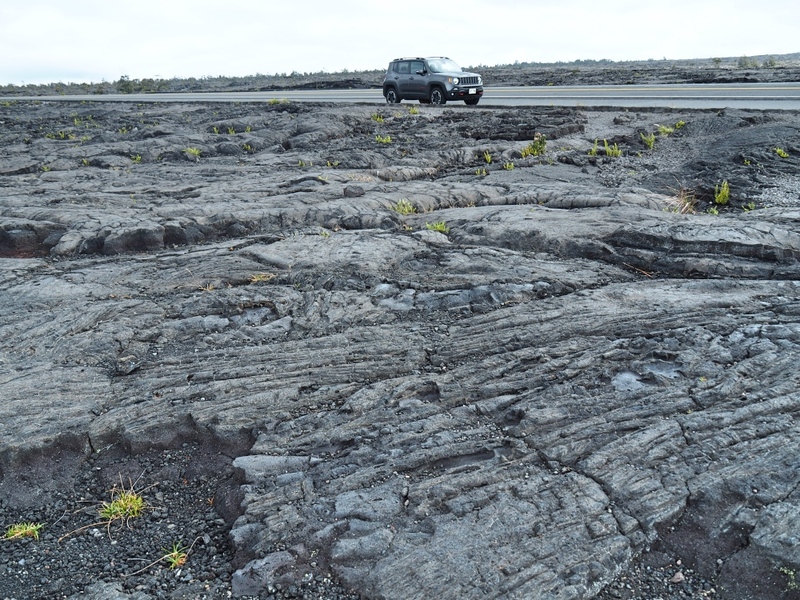 Lots of solidified lava fields. Our car is blending into the surrounding scenery. Tips: Allow at least three hours for this drive. It might not look like a long drive but you’ll spend plenty of time getting in and out of the car to take photos! 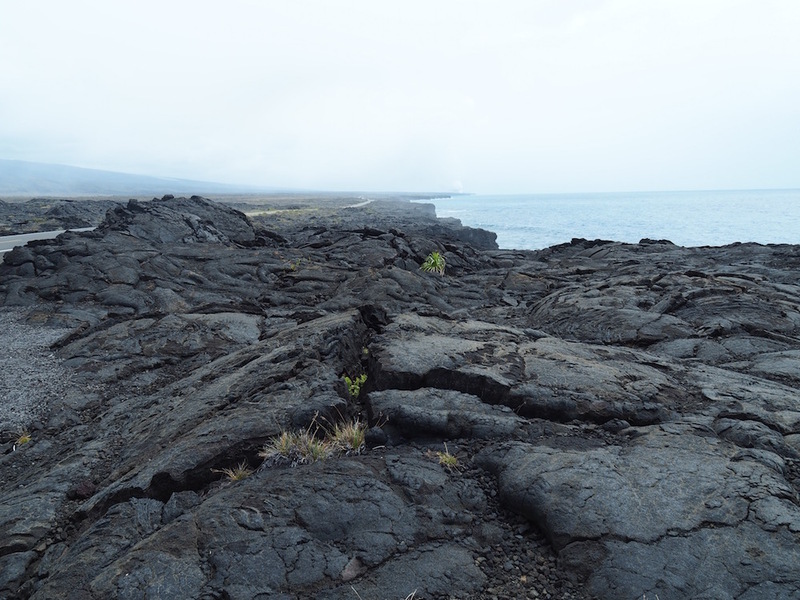 Coastal views and lava fields on Chain of Craters Road. 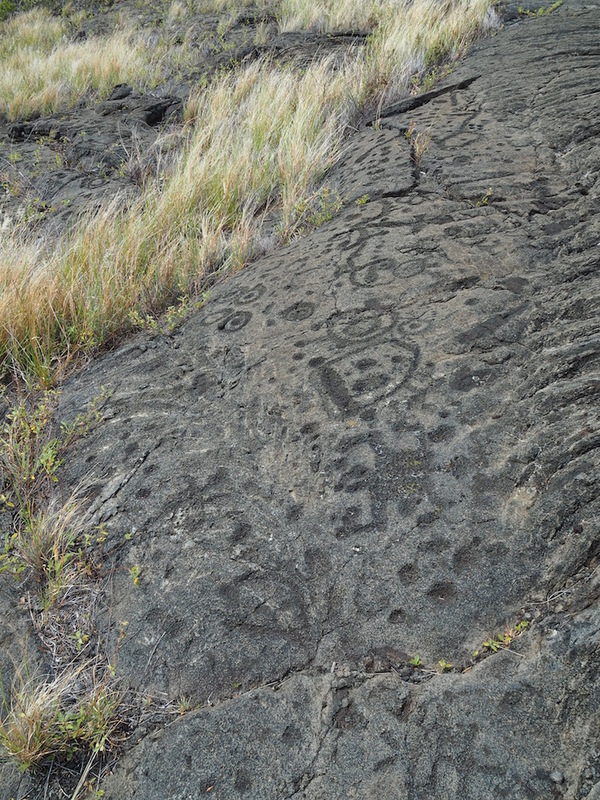 Found along Chain of Craters road, the Pu’u Loa Petroglyphs are worth a stop if you enjoy learning about the ancient Hawaiian culture and visiting their sacred sites. It’s a short 1.4 mile hike through a lava field and the path is well marked with rock cairns. 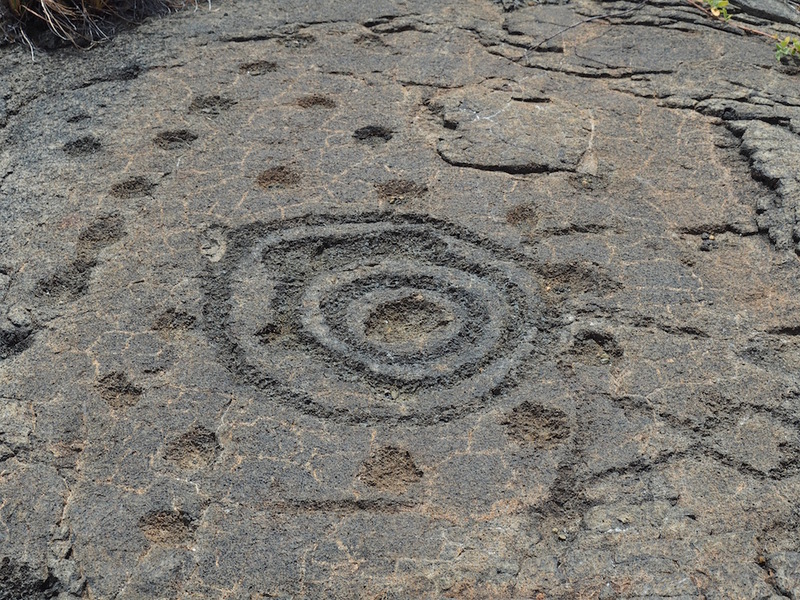 A boardwalk circles around the many petroglyphs so you can enjoy them without damaging them. The sign at the start of the hike to the Petroglyths. If you touch the ground you’ll feel the residual heat from the volcano even though you are miles from the crater. It’s pretty neat! Walking back from the petroglyths. 1- This hike gets extremely hot so make sure you take some water with you. 2- Wear proper walking shoes and be careful where you step as the terrain is uneven. Don’t trip and fall like I did. Lava rocks are sharp and rough and I have the scars to prove it! 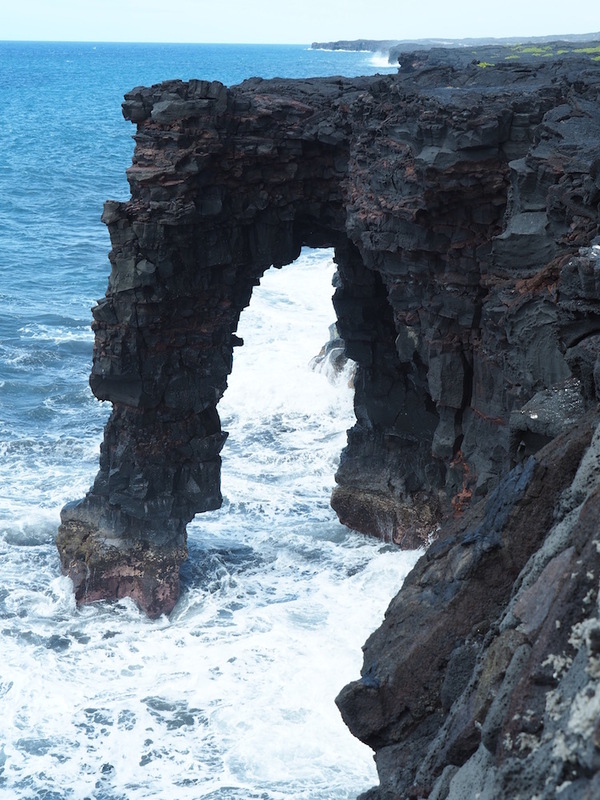 This arch is a good photo opportunity at the end of your drive down Chain of Craters road. It’s very easily accessible from the road. The arch was naturally formed by wave erosion many years ago and the viewpoint at the arch offers spectacular views of the ocean and of the waves crashing against the coast. Go there while you can as the arch will eventually collapse! Tip: If you have time, walk half a mile past the “Road Closed” signs to see where the lava flow destroyed the road. The ranger station near the arch marking the end of Chains of Craters Road. 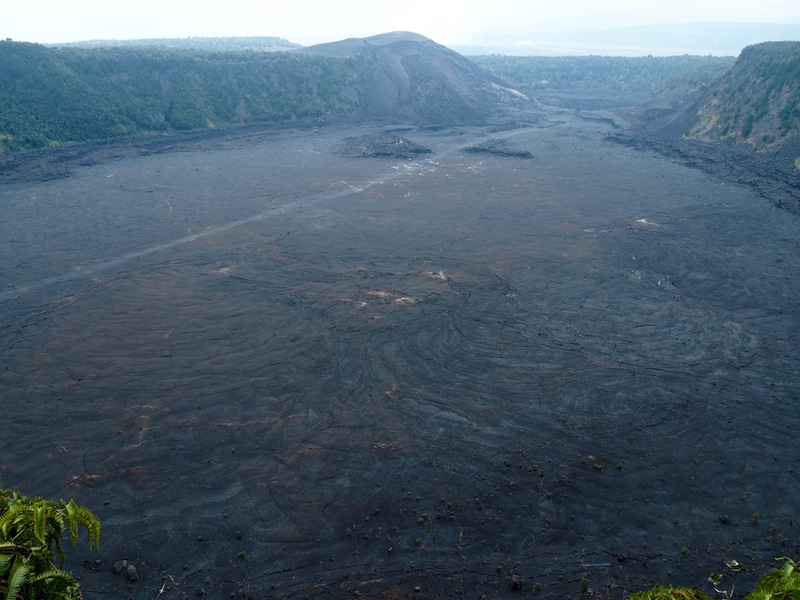 The Rim overlooks the Halema’uma’u crater and offers incredible views at night. It serves Hawaiian cuisine with ingredients sourced locally. It has a nice relaxed atmosphere with a fireplace and live Hawaiian music. Of course, it is rather touristy but it’s still a great place to go if only for the view. Tip: Make a reservation early if you’d like a table with a view over the crater. The Nēnēs are endangered Hawaiian geese and they like to hang out at Volcanoes National Park. You will see many signs around the park warning drivers to watch out for them as they seem to be drawn to the road like the Kangaroos are in Australia! You may or may not see them; they are endangered after all. But keep an eye out as you never know. We didn’t see any on the Big Island but we did see quite a lot of them on Kauai. They are actually pretty cute! 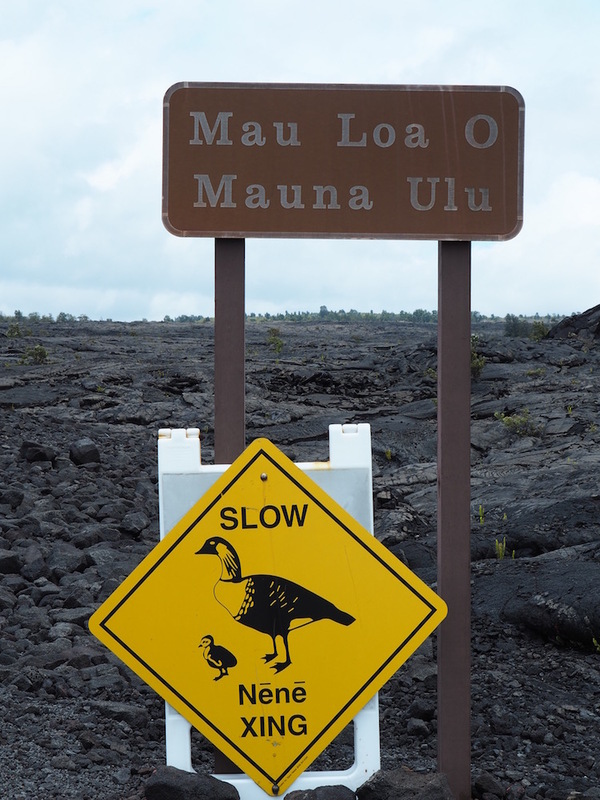 One of the many Nēnē signs. If you haven’t had your volcano fix yet, and you have a few extra dollars to spend, book a helicopter ride for an aerial view over the whole park, the volcanoes and the surrounding waterfalls. Our ride was sadly cancelled due to terrible weather conditions. We were extremely disappointed! We did however manage to take a lava boat tour with Lava Ocean Tours later that day. 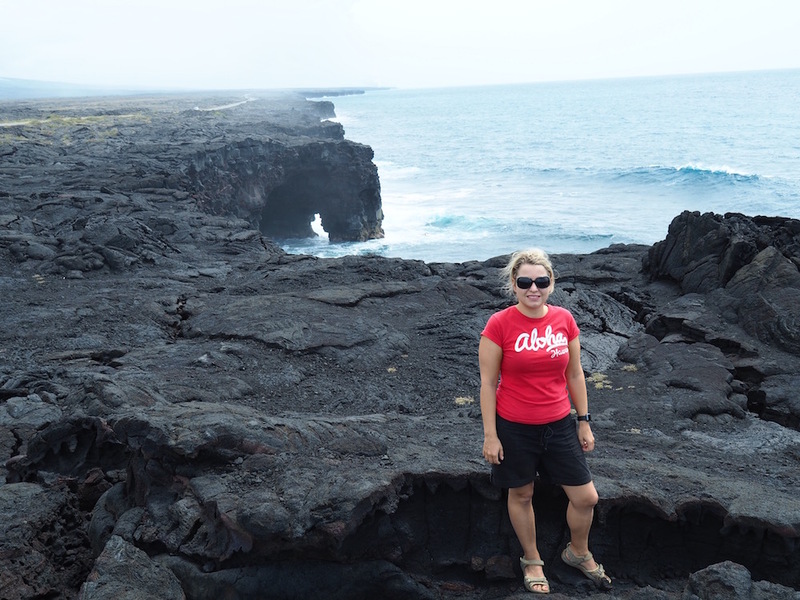 That boat ride took us out to where the lava flows into the ocean. This was an incredible experience and a highlight of our trip. It was totally worth the $200 per person price tag and we’d highly recommend doing it. We went quite close to the molten lava which was a little scary, so it’s not for the faint hearted; but we will remember this experience forever. As Volcanoes National Park is ninety miles from Kailua-Kona and thirty miles from Hilo, you will save a lot of time by staying in the small town of Volcano, which is a five-minute drive from the park entrance. You can even stay at the Volcano House right inside the park if money is not an issue. It even has rooms with views over the Halema’uma’u crater! We chose to stay in a cute little cottage in Volcano that we found on Airbnb. It was set within a rainforest and was really cosy; we loved it. There are many different types of accommodation in and around Volcano that cater for all price ranges. 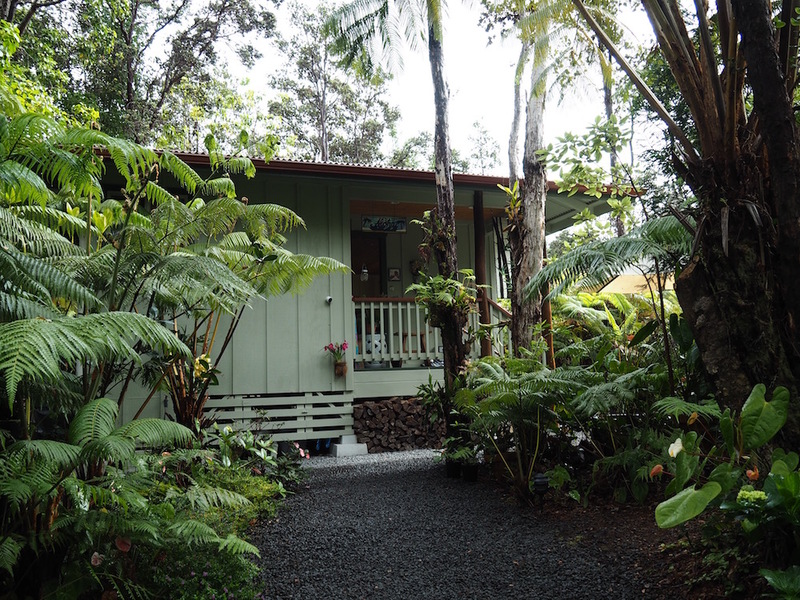 Our cute AirBnB cottage in Volcano just 5 minutes from the Volcanoes National Park. Our parking space amongst the rainforest. 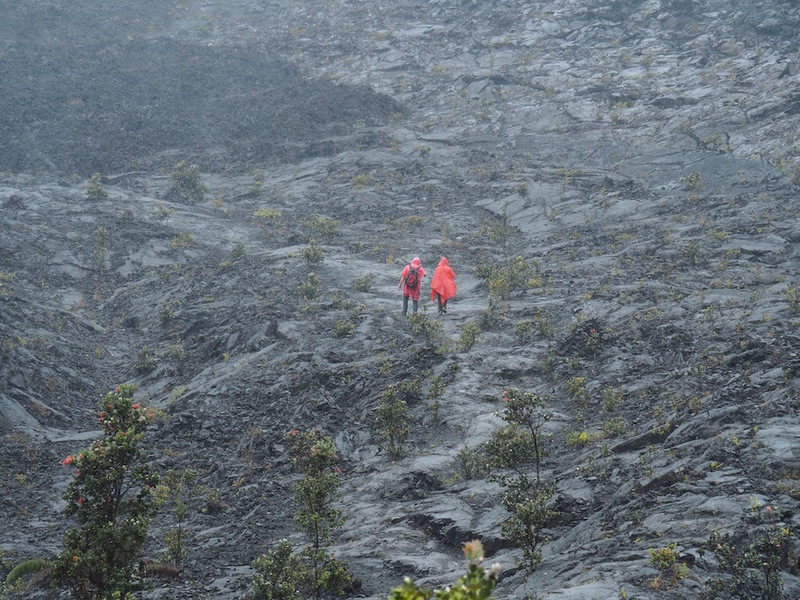 Even with the weather being against us, we had an unforgettable time at the Hawaii Volcanoes National Park. There is so much more to do in the park that you could easily spend a week there. Hope this article gave you itchy feet? Now it’s up to you to go and check out what might be one of the most incredible experiences of your life! To get some more information on the Hawaii Volcanoes National Park, visit the park’s official website.